If the structure consists of more than one repeating unit (mon, mer) or structural repeating unit, Copolymer (co) brackets/groups can be used to represent the structure. Copolymers might contain crossing bonds and star atoms. Create the components to form the copolymer. Click the Group tool on the toolbar then select the components to be included. In the "Create Group" dialog window choose the type ("Copolymer (co)", "Copolymer, alternating (alt)", "Copolymer, block (blk)" or "Copolymer, statistical (stat)") from the "Type" list. 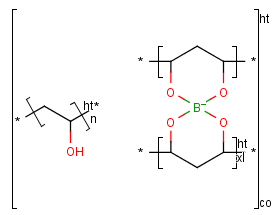 Draw the subpolymer to add outside of the bracket. Drag one part of the bracket to include the new subpolymer. The new molecule should be marked with blue circles when you hover the mouse cursor over it. Select the subpolymer to delete. Press the Delete button on your keyboard or with the Erase tool.